In the distance on the left are the northeast ridge of Grisedale Pike, Grasmoor, Hopegill Head, Ladyside Pike and Whiteside. 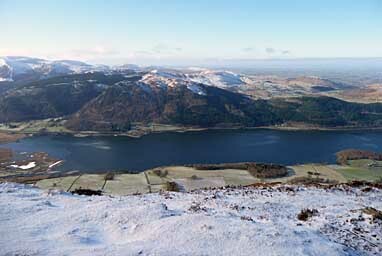 The much lower Gavel Fell, Blake Fell and Burnbank Fell merging into the Loweswater fells complete the distant view. On the left just beyond the lake is the hamlet of Powter How with the great cleft of Bakestones Gill going up to the right behind Barf and leading to the snow-capped Lord's Seat. Further to the right are Broom Fell, the hamlet of Beck Wythop at the foot of Ladies' Table, Ling Fell behind and Sale Fell on the extreme right. Larger version of this picture.